Since the little ones did not sleep in at all this morning - I set to work on this block for Buffy after breakfast. 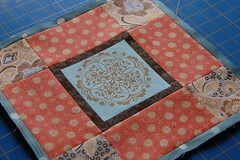 The medallion print has been featured in many of the blocks and I think the finished quilt will look great! very pretty! didn't you just love that medallion print. I love your block! And after numerous attempts at ideas, I think your interpretation has finally given me a direction! What a gorgeous block...I love that center print!